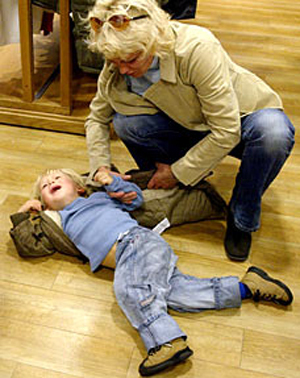 "Any tips for avoiding temper tantrums when my 5-year-old (high functioning) son and I are out shopping?" All parents have experienced the temper tantrum in the grocery store or the restaurant. While young people with High-Functioning Autism and Asperger's may have tantrums that seem larger than life at times, they are still tantrums. 1. Prior to going on outings, it is important that your child is prepared for what is going to take place. So explain the trip's agenda in depth. 2. You may want to have your child engage in some physical activity and play prior to the trip so that he is calm (and slightly worn-out) for the outing. 3. You also want to establish what the expectations are for his behavior during the outing. You will need to keep in mind his age and level of understanding when giving expectations. 4. Don't overload him with rules, but be consistent. 5. Monitor your child's behavior on the outing. If you sense that he is becoming overwhelmed, intervene at that point. Tantrums are not only embarrassing for you, but for your child as well. They don't want to behave this way, so if you can help them avoid it, you should. 6. If you are going to be gone for an extended period of time, prepare for it. Bring with you activities or things that your child enjoys to keep him occupied. If he doesn't function well during long outings, then start with brief periods of time. Go on an outing for 5-10 minutes, and if all goes well, reinforce that behavior. Then gradually increase that time period. However, if the outing is not for his benefit, don't ask him to engage in an activity for extended periods of time. Don't expect him to sit quietly for hours while you shop (it's unfair to any child). 7. When a tantrum occurs, leave! Just do it -- and do it NOW!!! Try not to create more tension by making a big deal of it. Simply stop shopping and remove him from the area. This may mean leaving for a few minutes until his behavior becomes calm, or returning home and planning your outing for another day. Tell him what was inappropriate, and why you are leaving, but try not to continue the discussion about his behavior once you are home. It's over! • Anonymous said... Don't take him shopping. I had no idea what my aspergers toddler was going through until he was old enough to tell me. The lights, the colors and displays, the crowds, the noise... It is too much for them to handle. And it is too much to expect them to. • Anonymous said... i have found short trips to the store work best. Also, bring along a toy or something that your child finds comforting. if too much noise is the problem, try headphones to drown out the noise. Hope this helps! • Anonymous said... Tough love: Just pick him up and carry him out to the car leaving everything behind. Keep talking to him in a calm voice that you will not accept this behaviour in public and you are going home now. You may need to say it loud enough for others around you to hear as well so they keep their noses out of your business. I had to do this only 3 times and my child never had another tantrum in public again. I understand that every child is different and I don't know the extent of involvement with your child but if this method helps anyone else out there, go for it. The first time I had to do this I was annoyed because I had to leave everything. So the other times he pulled this, I was just out to give him an opportunity to 'shop' and it was no hardship if I had to leave a store. • Anonymous said... Two people threatened to call CPS on me because I "was clearly a bad parent who couldn't discipline my child correctly" they have no understanding of how a child who is so vocal can be autistic. We're usually trying to do our shopping in one or two big trips on weekends when I can leave ds home with dad or he shops instead. Otherwise, very short trips work best. • Anonymous said...just try and stay calm and ignore others around you,my son would do cartwheels down the aisles in supermarkets and run and skid on his knees not easy. • Anonymous said... The normal, check for all the sensitivities, go when it is not crowded, ear plugs, sunglasses (lights can be horrible), gum or chewy. But number one thing - don't give in. Mean what you say and say what you mean - every time. I was prepared to leave the store at a drop of the hat or stand in line with a screaming child and angry customers. I have thick skin and a well adjusted 16 year old. Once I prepacked the car for a trip a day in advance just to say "I won't take a trip with kids that back talk and are unhelpful I am sick of warning blah blah blah... we are not going." Finally after a lot of promising and begging we left the next day (on the real date). They have never forgotten and both know I mean what i say. • Anonymous said... child once had a meltdown getting into the car at a grocery store. I was very firm with him...someone came by me and accused me of "abusing my child" and wanted to call the cops and Child protective services on me because "no child would be screaming in their child's presence. Other people came by and supported me..sigh. This was a couple of years ago. When my child was a toddler, another person wanted to do the same and we were out of town. Who are these people that think they know better than us parents of aspies.